Opening their 2017-2018 campaign in front of a capacity crowd of 3,079 fans in the Bren Events Center, the UC Irvine men’s basketball team did not disappoint, showcasing a band of young talented players in a 73-66 victory in their exhibition against Alaska Anchor. Sophomore forward Tommy Rutherford, one of five true freshmen who played in 36 games last year, caused a ton of trouble in the paint, garnering 18 points and six rebounds—five on the offensive—to lead the ‘Eaters in the scoring department during the night. Having gone through the jitters of playing in his first-ever college basketball game last year, Rutherford was simply ready to get out on the floor during Friday’s exhibition, embracing his expected role as one of four captains on the team. Junior forward Jonathan Galloway, who was named 2017 Big West Defensive Player of the Year, had a quiet offensive night with just four points on 1-5 shooting but upheld his already established presence in the paint by cleaning the glass with a team-high 17 rebounds to go along with two rejections. With a slow offensive night, UCI relied heavily on their defense, putting the clamps down namely in a second half period where the team got in the passing lanes and picked off seven of their 10 steals on the night. The ‘Eaters also had turned away six blocks, four of which came from redshirt junior forward Elston Jones who saw his first minutes of action as an ‘Eater on the evening after sitting out last season to hold eligibility as a transfer from Utah State. In the opening half, Alaska came out firing away and used their efficient perimeter shooting to take an 18-10 advantage over UCI. The ‘Eaters found a bit of success in their battles in the box and a few lay-ups, but struggled early with their outside shooting, going 3-13 on shots outside of the paint and 0-5 from beyond the arc for nearly 11 minutes. However, the tide soon turned when freshman guard Justin Wertner checked in and almost immediately broke the lid for the ‘Eaters, draining a corner three that ignited a string of long range bombs. Also off the bench, sophomore guard Darrian Traylor followed the triple with one of his own before Wertner spotted up in the same corner for yet another triple to hand UCI their first lead of the night, 21-18. 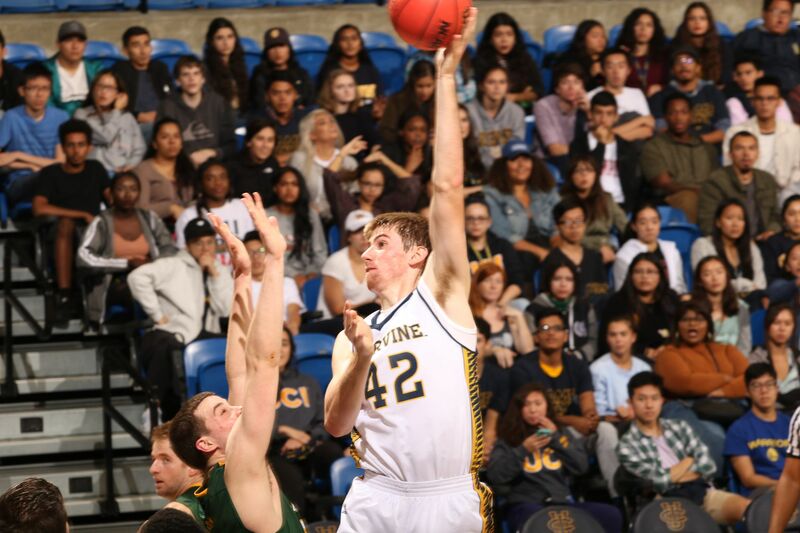 From that triple on, the ‘Eaters all of a sudden improved their three pointing shooting to 33.3 percent as the role reversed for the Anchorage who ended up going 26.9 percent from the floor and 20 percent from three. Catching their rhythm on a few more runs, the ‘Eaters would held into the half up, 30-25. They would not relinquish their lead for the rest of the night. Rutherford exploded out of the second half, scoring nine of UCI’s first 11 points in the period, including a thunderous two-hand jam in retaliation of a momentous Anchorage dunk just a play prior. As Rutherford’s heat check pushed the gap to 11, 42-31, Galloway continued to snag the boards anchor the defense which the ‘Eaters collectively kept up in their intensity, showing a little full court coverage on a few plays while keeping constant on-ball pressure. Picking up from where Rutherford left off, sophomore guard Max Hazard broke out on a little run on his own. Glued to his defender, Hazzard lifted the crowd up with his suffocating defense that eventually materialized in a one-on-one steal and breakaway for a lay-in that he would later follow up with a pull up triple to push the lead out to 51-35. Holding a considerable lead, UCI seemingly let up, allowing Alaska to crawl back. Senior guard Maleke Haynes, who led Anchorage with 13 points, three steals, and two assists, drew a foul shooting a triple and later a foul on a drive; knocking down four of his five attempts at the line, Anchorage was all of sudden down just five, 69-64, with 1:38 left to go. With a few minor adjustments and substitutions, however, the ‘Eaters would fend off the comeback. Rutherford went on to maneuver his way into hole for a lay-in as Galloway came up with a huge block and knocked down two free throws to ice the game, 73-66. The ‘Eaters will now head on the road where they will face South Dakota State on Nov. 10 before traveling to Denver on Nov. 12. For Rutherford and Galloway, they look to embrace that time of year again.